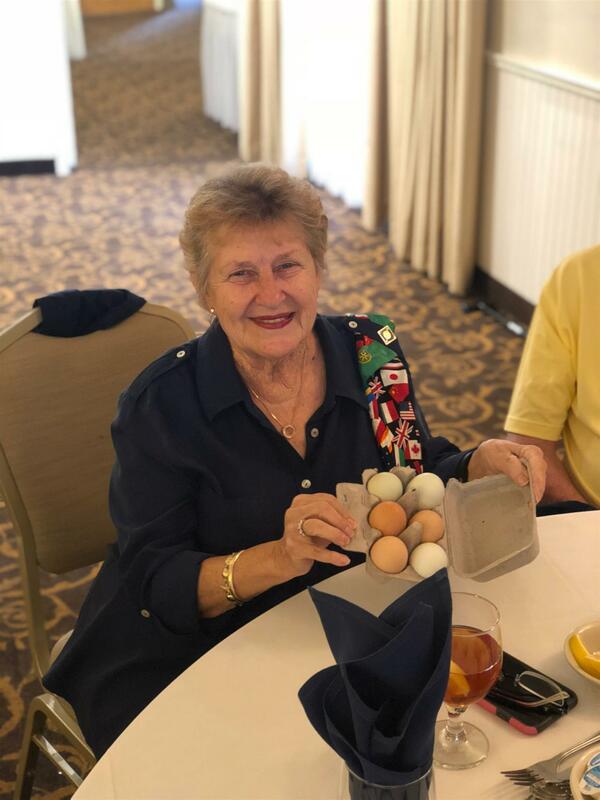 Club Auctioneer John P. was tasked with auctioning off a ½ dozen very precious eggs donated by DG Tim Lundell’s backyard pets. To the surprise of many, the bidding went past the former high bid of $200 and finished at $230. Winning bidder was Avis L. and the funds are to go to The Rotary Foundation. To watch the video, click here! A new member induction was held for Kirsten Bridges. 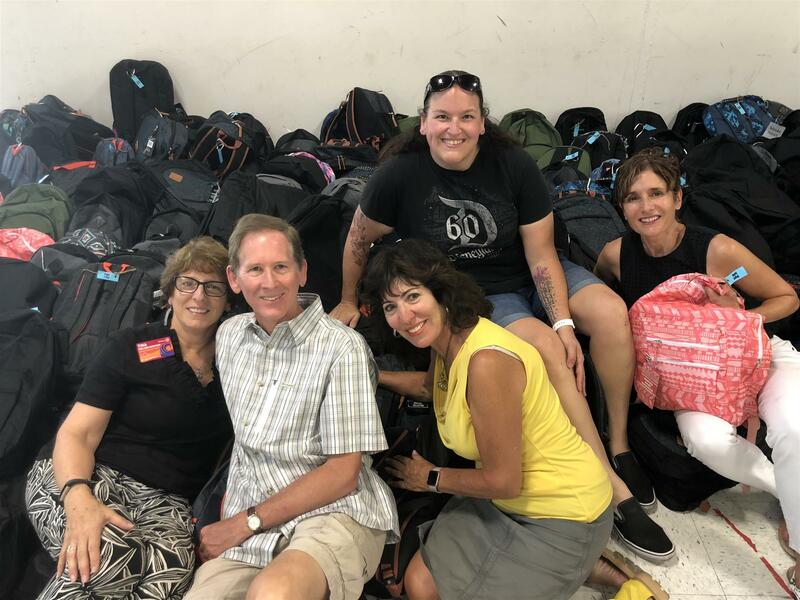 She was formerly in the insurance business and also worked at Williams Sonoma, which is why many shopping members “think she looks familiar”. She was sponsored by Suzanne B., and welcomed by DG Tim Lundell. The annual club BBQ last month was well attended and well received. Suzanne B. showed her skills at video production and presented a fun slide show of the event with music and captions. It is also showing on our webpage and Facebook page, where we have 700 followers. Well done Amy P. in getting the word out on our fun and inspiring club! President Andrew H. announced he is looking for a champion and 10 volunteers to run a LG Rotary booth at the Taste of Los Gatos event 9/22. Deadline to sign up is 9/15. It’s a good way to show the community what we do and possibly recruit. The LG Morning Rotary major fundraiser Claws for a Cause is this Saturday at 5:30 pm at the Los Gatos Lodge. All were encouraged to help support our fellow Rotarians. 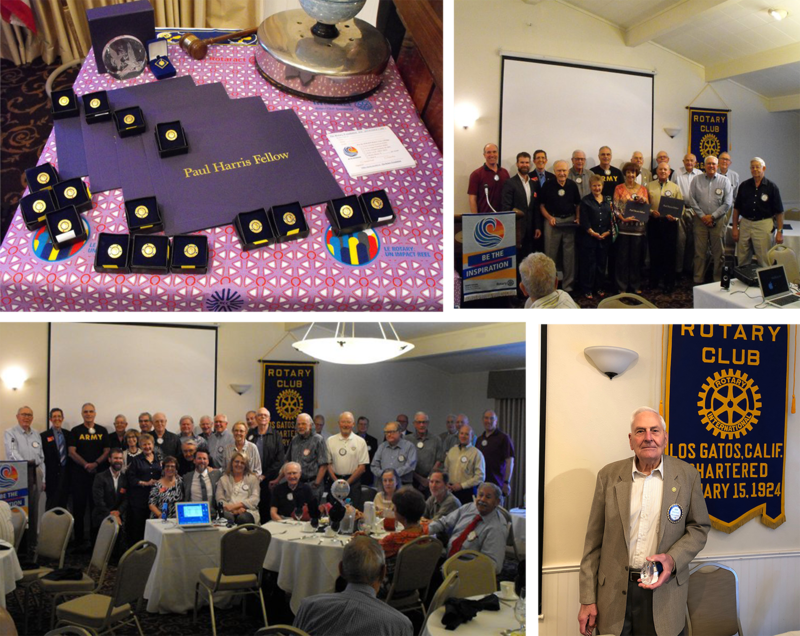 District Governor Tim Lundell helped to hand out the club’s Rotary Foundation annual giving awards. The initial group was for donors over $200, followed by Paul Harris Fellows (over $1000/year), as well as special high giving levels. Tina O. introduced DG Tim Lundell. Originally from Portland, Oregon, Tim went to law school at SCU and now has a law practice. 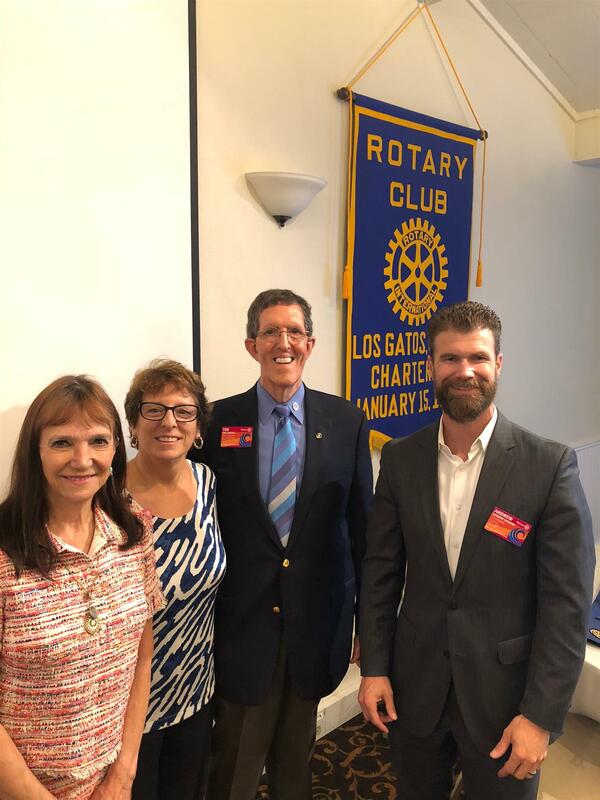 He is a member of Los Gatos Morning Rotary. Our District has 54 clubs, including the world’s 8th largest (trivia question: which club?). There are 534 clubs total in over 200 countries. DG Tim Lundell noted he has witnessed many claiming to have the best Rotary Club in the world, and says there’s nothing wrong with that claim, indeed we all can be the best. The DG explained the process in defining his theme for the year. Essentially his theme includes training/learning, which leads to leadership, which leads to inspiration. He noted these areas plus membership are important since we are all sitting in the shade of a tree someone else planted long ago, and it is time for us to plant as well. We each are already community leaders, and we need to “Be the Inspiration” as noted by the Rotary International President’s theme this year. He closed with stating he joined Rotary for business and fellowship, but stayed to change the world. He invites us all to be the inspiration.